When monitoring beyond a fence line, just over a property line or beyond a building, it is vitally important that the cameras be as steady as possible in order for the Camera Analytics or Motion Detection to work efficiently without a lot of errors and false alarms. That’s where the rock solid performance of the SteadyMax Poles and Attachments come in. No other pole and attachments can match our steady, rigid performance under heavy loads and strong winds. The Reacher Attachment was developed to help see down a street, alley or other areas that may be just beyond or past a fence or property line. This attachment was designed to allow a PTZ or even a Panoramic camera to reach beyond the pole mount area to see around a corner, down an alley or out into a street. 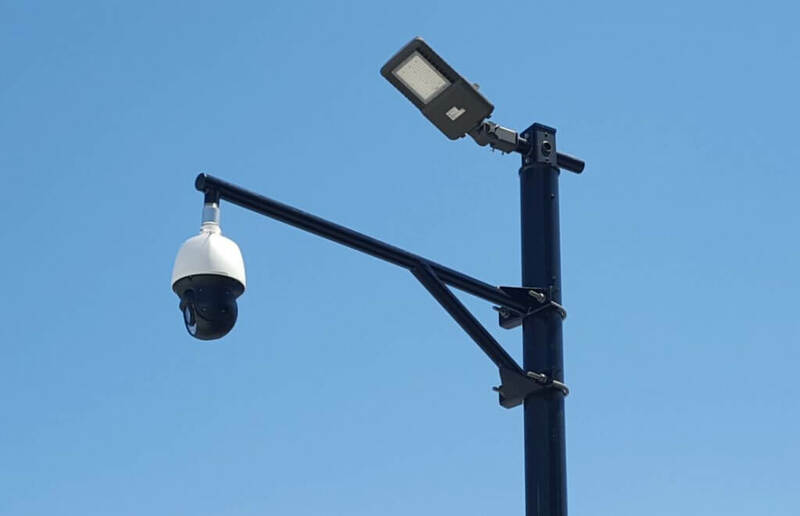 Most often it is used at a lower 12′-16′ height to reach beyond a fence line, in conjunction with an LED Area Light to come on when the Analytics are triggered (see pictures for common uses), or is turned on by motion detection or an operator. Many times, customers at High Security areas may be using a High Security fence. These are excellent deterrents and have qualities normal fences do not have, but their high-tensile design may transmit sounds and frequencies that could effect performance of cameras and the analytics being used. Also, these fence systems are usually more tightly woven than many types of fencing, so cameras and poles need to be set apart from the fence structure. Winds can easily catch these fence structures and vibrate any fence pole attached. For this reason, Strong Poles recommends that our SteadyMax poles be set back several feet from the fence line. So The Reacher attachment is designed to reach out 5 feet from the pole, to reach beyond the fence or property line – but not be a part of any vibrations and wind induced movement that the fence may incur. This is yet another way that we can guarantee that your cameras be as rock solid and steady as they can be. The Reacher Attachment is attached with two large 5/8” U-Bolts and pole clamps that lock to the pole and will not move. The attachment also uses strong gussets at the base to insure that the attachment does not sway or have any movement. The PTZ Mount is a 1-1/2” NPT male connection (also comes with a joiner with set screws to allow male to male attachment), and we also have optional reducers to accommodate any PTZ’s that may have 1” connections (GE, etc.). The pipe that The Reacher is made of, is large enough to accommodate wiring and connectors, effectively providing a junction box type of cavity. This attachment can also be ordered with a pole that has an additional handhole behind it (some may be in stock already).